Editor's Note: Today's blog by DigitalGov highlights how government communicators are engaging with millenials via Snapchat. HIV.gov prioritizes using digital tools to amply HIV messages within communities of color and then, sharing with you what we learn. If you'd like to know more about Snapchat or another social platform to extend the reach of your work, sign up for Virtual Office Hours - your free, phone-based training session. What does Snapchat, the disappearing message-and-video platform most used by teenagers, have to do with government outreach and communications programs? Well, Snapchat has quickly become an incredibly effective digital storytelling medium, and content creators across multiple government agencies have adopted it as an important part of their programs. A recent New York Times article described how nearly 35 million users in the United States watched highlights and stories from the Summer Olympics on Snapchat. Furthermore, it allowed individual athletes to broadcast their unique and personal experiences at the Games. Perhaps most importantly, Snapchat is one of the best ways to reach young people—it reaches a reported 41% of Americans aged 18-34. In comparison, the average TV network only reaches 6% of the same demographic. If you want to engage with Millennials, Snapchat is the social media channel for you. Last week, Edgardo Morales, Outreach and Marketing Specialist at USA.Gov, and Emily Furfaro, Social Media Specialist at NASA, joined Justin Herman, Manager of Government-wide Social Media and Digital Engagement Programs at the General Services Administration (GSA) for a DigitalGov University (DGU) webinar, Snaps and Stripes: Sharing Public Service Stories with Snapchat. Edgardo and Emily talked about their agencies’ work using Snapchat to engage and communicate with the public. Edgardo and his team quickly identified that Snapchat was the right place to engage with Millennials, a particular interest because USA.gov has a somewhat older audience with an average age of 40, and they want to get the content they create to more people. Another important priority is to make USA.gov more relatable and personable, and to share government information in a fun way. 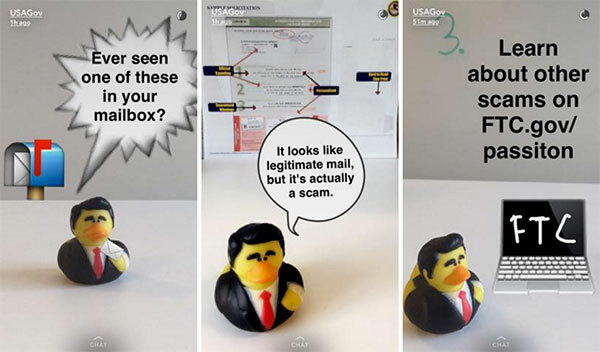 The team decided to create a recognizable mascot for Snapchat, and found “Presidential” rubber duckies who are now the stars of the USA.gov Snapchat account. The team has even been recognized “out in the field” when they are shooting with the now-famous rubber duckies! 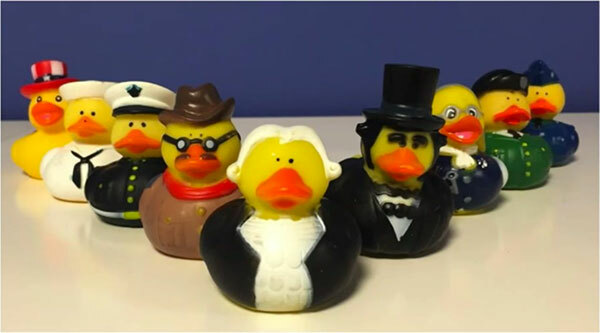 They use these mascots to help tell fun and engaging stories – one recent example was a Snapchat Story about the new $20 bill from the Department of the Treasury. However, they don’t always use the mascots; it is context dependent. Other types of content they share include immigration information, emergency preparedness, and really anything else that is a priority across the wealth of content and services on the USA.gov website. Recently, they provided a sneak peak of the new National Museum of African American History and Culture, which was very popular. Currently, they are working with the Peace Corps to do a weekly Peace Corps volunteer Snapchat takeover. They provide access to their account to a volunteer abroad who is sharing stories of their daily life. Accessibility is always a priority at USA.gov—they plan for accessibility before they start creating content. Edgardo mentioned that they keep it succinct, always have a clear beginning and end of the story, and that they storyboard it in advance using Word or PowerPoint. After creating the Snapchat story (a story is simply multiple videos strung together on the platform), they download the story, which is done by going to âMemoriesâ on the platform to download or text or email the story to yourself (you can also save each snap to Memories as you shoot each video). Then, they edit the video file for accessibility. They narrate with great detail (including audio descriptions where possible), close-caption it, and add a text transcript. To ensure that everyone can engage with the content, even after it has disappeared from Snapchat, they upload the video to their website, their Snapchat Stories playlist on YouTube, or other social media platforms. The team at USA.gov has been using Snapchat as part of their content and social media strategy for about 5 months, and it has quickly become their most-engaged platform. They are producing about 2 Snapchat Stories per week at this time.Almost 50% of the audience watches full stories (the collection of videos with a beginning, middle, and call-to-action at the end). In terms of metrics, they look at “starts” and “endings,” completed views, engagement, screenshots, and views on other media, like YouTube. Snapchat doesn’t have very advanced tools for marketers around analytics yet because it is so new. Screenshots tend to be very helpful because they show strong intent to remember a call-to-action or important piece of information. One of the most important tips Edgardo shared was to never snap alone. His team always works at least in pairs when they’re snapping – one person captures the content, and the other looks over their shoulder to make sure that the content is appropriate and that they don’t make any mistakes. Find a Snapchat buddy! 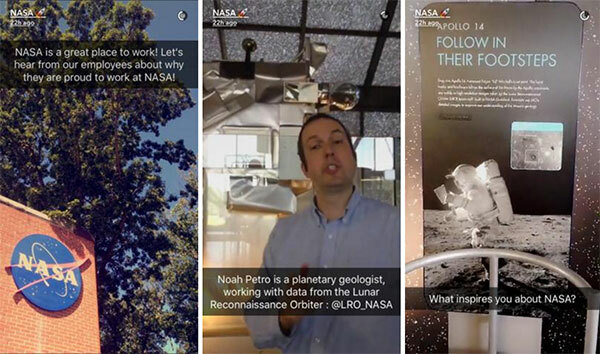 While Edgardo Morales and team are effectively using Snapchat to reach younger people, for Emily Furfaro in the Office of Communications at NASA, Snapchat is an important medium to complement traditional storytelling that is happening across their mind-boggling 512 social media accounts across 14 different platforms. Snapchat allows Emily and team to package social media content differently and utilize a more playful and relaxed tone. All of those social media accounts require sophisticated and coordinated content calendars – but they opted for only one Snapchat account which is responsible for telling all of the important stories across NASA. Like USAgov, every NASA Snapchat story starts with storyboarding a beginning, a middle full of content telling a chronological story, and an end with a clear call to action. Fact Fridays, an opportunity to promote evergreen content like science facts. Additionally, NASA cross-promotes stories across their many other social media accounts, and Emily pointed out that Instagram Stories, a new feature on the photo and video-sharing platform, is essentially the same thing as Snapchat Stories, and the content can be published there easily as well. In terms of calls to action, they usually suggest that people follow one of their specific Twitter accounts for more information. Additionally, they often use “take a screenshot of the next snap for the registration URL” for various events. This tends to result in a thousands of screenshots vs. hundreds, and they always keep the URLs simple and short. Emily mentioned that they don’t create enough content yet to make the Snapchat âDiscoverâ channel an option. Discover requires that you have 5-10 unique pieces of content for every day of the week, and they don’t produce enough at this point. Depending on the week, they might produce 2 Snapchat Stories, but on busy weeks it can be up to 4 or 5, for example during a spacecraft launch. You can follow the NASA Social Media Team on Twitter at @NASASocial, and USA.gov at @USAgov. On Snapchat, just search for NASA and USAGov. The full webinar, with a great Q&A section at the end, is available to watch on DigitalGovâs YouTube channel or the embedded player below.